I'm so excited about a couple of new things and newly appreciative of a couple of old things, so I thought I would share them with you. I love my new purse!!! I wanted a purse that would serve dual purposes: be an attractive enough purse to take places, but also be able to carry art supplies and sling on my back for walks. I found it at EuroComfort and I love it. There is a place for all of my favorite art stuff and my everyday necessities. You can see here that it stands on its own and has a nice adjustable strap to throw it over my shoulder or on my back. 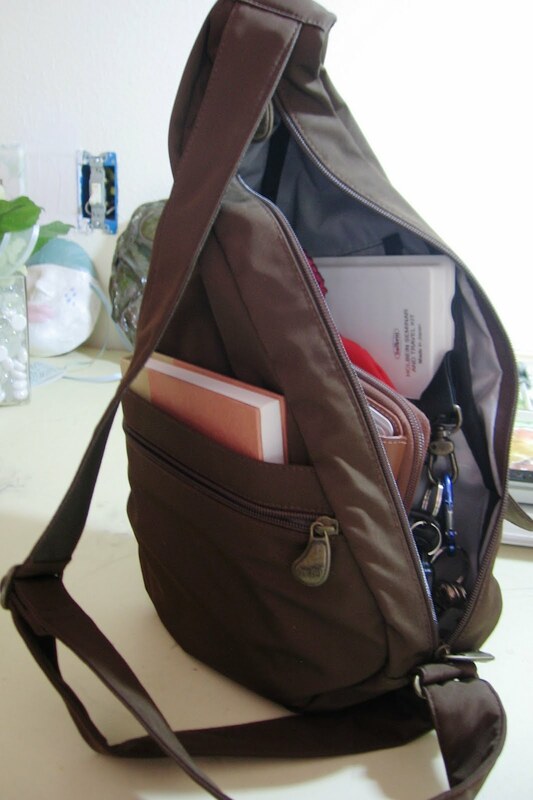 It is well designed to have plenty of pockets inside and out. You can also see here my second favorite thing: my illustrated journal. I love my handmade journal! 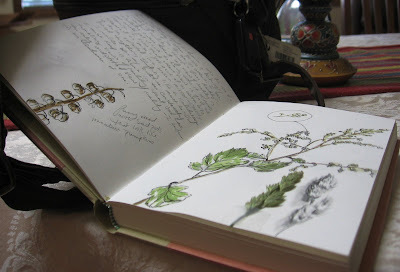 I've been re-reading an old book of mine about creating an illustrated journal. The author laments the fact that finding a good journal is extraordinarily difficult to find. 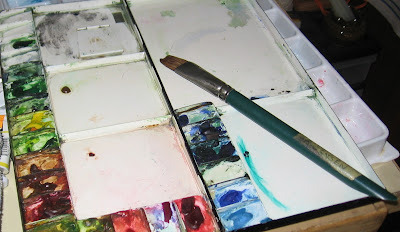 She then goes on to list the qualities of a good journal: strong enough paper that will stand up to drawing, erasing, pen work, even a light watercolor wash; paper that does not have a slick surface and has enough of a tooth to take graphite well; creamy color rather than bright white. She goes on to say that commercially produced journals are just not adequate and that she used to be able to get wonderful journals that were handmade from an artisan, but that they weren't available anymore. How fortunate I am to know an incredible artist who creates these beautiful well-crafted books and a mother who bought one for me for my birthday!! Speaking of gifts, I am becoming reacquainted with two old friends: my palette and my 1" flat brush. My parents gave these to me so long ago, I think I was about 18 years old. If you look closely you can even see my maiden name on a piece of tape on the brush. That brush has been my workhorse for over 30 years and still is in excellent shape. Karen - I wish I stood up as well as that brush! By the way, You are My Everything! Some of my favorite things: Vintage coffee mugs that make me smile, my little orange tea pot, an antique Singer, Herman the German Ermine, my Seagull guitar...I'm sure there are others. YOU are my all-time favorite pal. When do we get to hang out and do fun (and favorite) things together?? ?